FACTS FOR THE PETITION AGAINST A NEW STADIUM AT FULLERTON COLLEGE. Fullerton College wants to build a 4,500-seat stadium with six 100-foot lighting structures, plus a megawatt public address sound system adjacent to our residential neighborhoods. Proposed stadium will be TWICE AS LARGE AS THE STADIUM WE DEFEATED IN 2009! The estimated $3 million (we doubt this figure) stadium would impact 1,000s of people who live in the area. The proposed stadium would be on the block next to the existing FUHS 6,700-seat stadium and will DOUBLE IMPACT the area. It's a WASTE OF PUBLIC FUNDS. WE DO NOT WANT ALL THE TRAFFIC, NOISE, LIGHT, GLARE, VIBRATION, TRASH AND OTHER IMPACTS that a new stadium will bring. The college has disregarded the neighbor’s quality of life for decades. Now they say, they “want our input." This is our input: WE DO NOT WISH TO SUFFER! ENOUGH is ENOUGH! 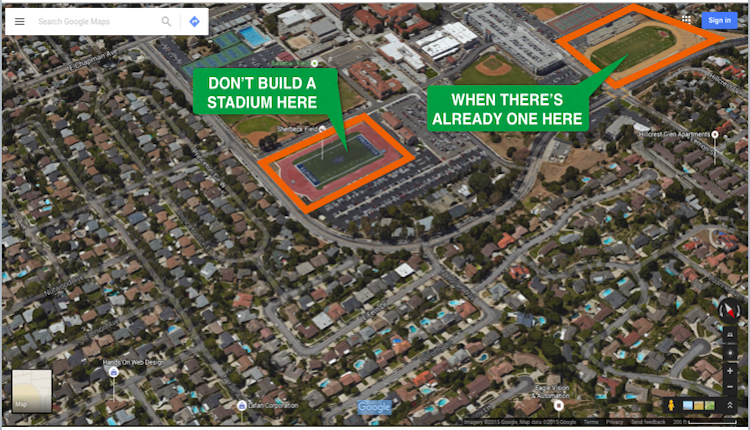 We, the undersigned, OPPOSE A NEW STADIUM AT FULLERTON COLLEGE including the addition of seating, lighting, and a sound system to Sherbeck Field. We join with the Fullerton College Neighborhood Action Council to protect our neighborhoods. The Fullerton College Stadium Opposition petition to North Orange County Community College BOT and Chancellor of the California Community College System was written by Fullerton College Stadium Opposition and is in the category City & Town Planning at GoPetition.